Discover what’s new in pediatric healthcare. Stay on the cutting edge with regular updates on research, medical news, continuing medical education opportunities and more. Talk about a hat trick! For the third time, CHOC’s pediatric intensive care unit team was recognized by the American Association of Critical-Care Nurses for its exceptional patient care. The gold-level award is the Beacon’s highest honor. Learn more about this distinction. Is your LinkedIn profile photo from three hairstyles ago? And how current is your contact information there? With social media growing increasingly important for career advancement, as well as staying in touch with colleagues, friends and family, KevinMD offers 6 ways for physicians to improve their LinkedIn profiles. More than 150 worldwide leaders in the field of children’s leukemia treatment and research attended the recent fifth-annual Society of Young Adult Oncology (SAYAO)/CHOC Children’s Leukemia Symposium, where 33 speakers from various renowned institutions participated. CHOC neurologist Dr. Sharief Taraman discusses with the Chicago Sun-Times how brains learn differently, and offers some tactics and timelines that can improve the process. In U.S. News & World Report, CHOC hospitalist Dr. Jennifer Ho offers her perspective as a spike in gun-related suicides alarms pediatricians nationwide. CHOC pediatrician Dr. Eric Ball and other medical professionals shared some personal healthy habits with Reader’s Digest. See a full list of clinical events at CHOC. This email includes links to other websites which provide additional information that is consistent with the intended purpose of the CHOC Provider Connection newsletter. Linking to a non-CHOC site does not constitute an endorsement by CHOC of the sponsors or the information and products presented on the site. 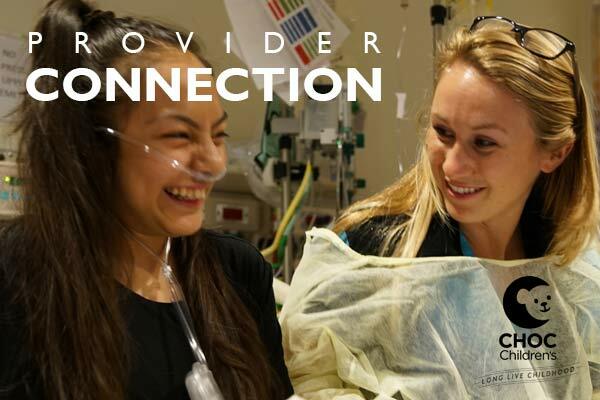 You received this email because you are subscribed to Physician Connection from CHOC Children's.